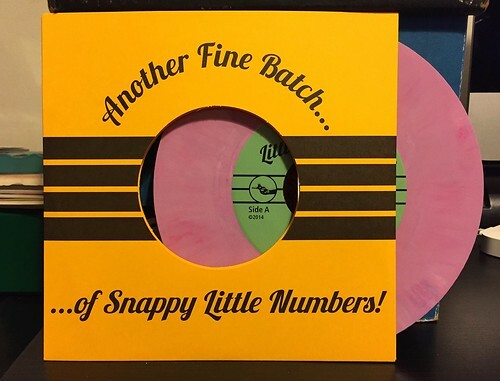 I've been singing the praises of the Snappy Little Numbers label for a bit here on this little website. They've been putting out some great records lately by smaller, but incredible bands. I'll admit it though, I was pretty surprised when I popped this guy on the turntable. While the label has made a name for itself (with me anyway) for some solid, poppy indie and punk, MAKO1972 is a little slice of some dissonant, noisy chaos. Despite my obvious pop leanings, I can get down with the occasional loud and noisy band if they're doing something interesting. All you need to do is look towards my Drive Like Jehu or Blind Shake albums. While MAKO1972 may not be quite at that level yet, this 7" is a fun listen. A side "Cannonball Lecture" is a fast, screaming, intense ripper. The lead guitars on the verse are intricate and dynamic, coupled with some intense shouted vocals. They build into a huge chorus where the guitars somehow manage to get even louder. B side "Even Ghosts Perish" is the complete opposite end of the spectrum. It's significantly slower and more deliberate with subdued vocals compared to "Cannonball Lecture." Considering that this 7" doesn't really play directly to my personal tastes, the fact that I think it is pretty good should say something about the quality of the songs. If your tastes favor the noisier end of the Dischord catalog (my tastes always lead me back to Trusty), I imagine you'll like this record even more than I do.